When I got my first induction cooktop I was determined to have a new cookware set. Even though my old pots and pans were induction compatible, there was no way I wanted to use them on my new shiny cooktop. Of course, we all have one or two favorite pots, and yes, I did keep using a couple old ones. But I was thrilled to have the chance to find one of the best induction cookware sets for my new kitchen. Because that was my first ever induction cooktop, I really had no experience with induction cooking and you won’t believe it, but I managed to burn my new skillet the first time I used it. I knew induction was fast but I didn’t understand how responsive it was until I used it. 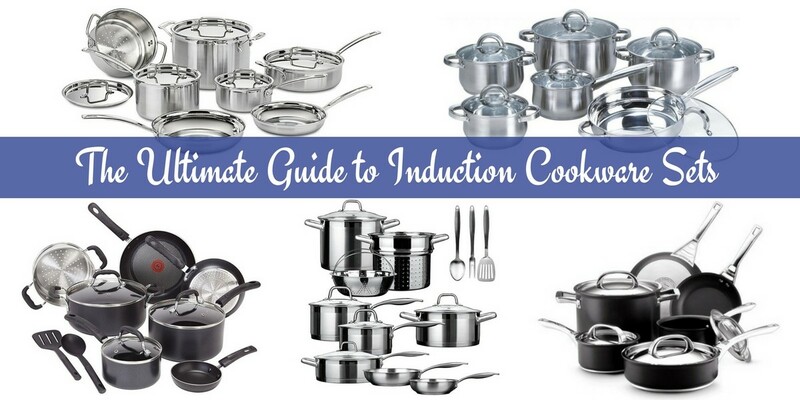 ⇒ Click here to see the Top-Rated Induction Cookware Sets available online. Note: this guide is regularly updated with additional products to give you the best. Stainless steel is ideal for induction cooking. And it’s a healthy material to use for food preparation and cooking. Personally, I love using stainless steel pots and pans. They’re so durable and easy to clean. Duxtop is a well-renowned brand in induction cooking. And they product high quality products. If you’ve ever used one of their portable induction cookers, you’ll know what I’m talking about. Is this induction cookware set really 17 pieces? It’s a 17-piece set but three of the pieces are actually utensils. The utensils are nice to get in the set but if you’re comparing sets, this is more like a 14-piece set if you’re comparing the pots and pans and steamers. The set if made of 18/10 stainless steel. The handles are riveted on. And the handles are formed in a shape which is very comfortable. They also have an anti-slip satin finish. For the price on the Duxtop set, click here. If you take a look at the reviews on this cookware set, no one has experienced any problems with the handles getting hot. In fact, at the time of writing this set had an average of 4.6 out of 5.0 stars for well over 500 reviews on Amazon. This is a very popular induction cookware set with very happy customers. This is the best induction cookware set for appearance and convenience because it comes with lids to fit everything and they’re attractive looking tempered glass lids. You’ll be pleased how they look in your kitchen. The reason I like glass lids is because you can see your cooking without having to lift the lid and let the heat escape. Everything in this set is dishwasher safe. There’s no worry about cleaning up. All the items are easy to clean. This induction cookware set is also oven safe to 550 degrees Fahrenheit. Personally, I’ve never needed a cookware set to be freezer safe, but this one is. So, if that’s something that’s important to you, this set will give you peace of mind. What sets this product apart from the others? If you’re looking at induction cookware reviews you want to know what the differences are between sets. Obviously this is the best induction cookware set for anyone looking for high quality stainless steel pots and pans. However, the thing that makes it different from other induction cookware is the base of the pots and pans. Duxtop have used impact-bonded technology to create the base using both aluminum and stainless steel. At first I know what you’re thinking. Aluminum won’t work on induction cooktops. That’s true but this set uses aluminum encapsulated between stainless steel to achieve a superior product with their induction cookware. Duxtop uses pressure and friction to form the bond in the aluminum and stainless steel which is the base of the pot. The impact bonding machine applies instantaneous pressure applied by a friction press to form a secure attachment without the use of any adhesive being applied. What do you get in this induction cookware set? If you have more than one cooking source in your home, you’ll be please to know that this set can be used on all cooktops. It suits induction, electric, gas, infrared, radiant glass and ceramic cooktops. Overall, this Duxtop SSIB-17 Professional 17-piece Set is the best induction cookware set for people who want bang for their buck, high quality and products that look good in their kitchen. To begin with, if you prefer non-glass lids, this is the best induction cookware set for you. This Cuisinart set is high quality 18/10 stainless steel with riveted stay-cool on stove top handles. 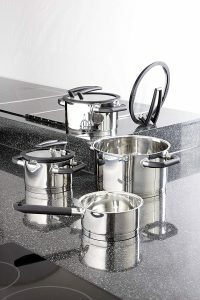 The lids are solid opaque stainless steel with high raised handles to keep your knuckles away from the heat of the lid. Now, obviously I’m not providing induction cookware reviews only on stainless steel cookware but since it is so popular I thought it worth including this second stainless set with the different lids from the Duxtop reviewed above. And the lids on this Cuisinart induction set have a wide edge at the top to ensure they seal in the heat and moisture. You’ll love the brushed stainless finish on the exterior of these pots and pans. The interiors are a mirror-polished finish for non-reactive quick release of ingredients. The set is oven safe up to 500 degree Fahrenheit. And all the pieces in this induction cookware set are dishwasher safe for easy cleaning. These are multi-clad constructed pans. The tri-ply heat surround technology, used by Cuisinart, sandwiches an aluminum core in the base and side walls for even heat distribution. What’s included in this Cuisinart induction cookware set? This is the best induction cookware set for anyone who wants high-quality cookware that also looks good. In particular, you’ll love this set if you want stainless steel lids. This is a durable cookware set that should last a lifetime and beyond. ⇒ At the time of writing, the best price I could find on this Cuisinart 12-piece induction set was HERE. It was on sale for under $200. Other stores are selling it at this time for $299 and $247. At $247 it is still a good price but… Click here for the updated price and see if it is still on sale under $200. ⇒ For an excellent price on this Heim induction set, click here. If you want bang for your buck on one of the best induction cookware sets, look no further. This is the best induction cookware for you. This is good induction cookware. Induction cookware reviews aren’t complete without including an inexpensive option. Made from stainless steel, these pots and pans include glass lids. You get a lot for your money. These induction compatible pots and pans look good and function well. The base includes a three layered thermal bottom for even heat conductivity. Despite being inexpensive, this set has a lot of very good reviews from buyers. At the time of writing, this set has an average of 4.3 stars out of 5.0 for over 500 reviews on Amazon. This is good induction cookware for the price. Some buyers have commented that there were some discoloration marks on the saucepans when they arrived. Most buyers found it was just a result of the manufacturing process and it cleaned off so it wasn’t a problem. What’s included in this induction cookware set? ⇒ At the time of writing, Amazon offered the best price on this Heim Concept cookware set, CLICK HERE to see the current price. Some stores were offering this set for almost double the price, although there were a couple of online sellers offering it for only $10 more than the Amazon price. Still, the Amazon price was the cheapest. This is the best induction cookware set for families or singles who don’t want to spend a lot of money on cookware (saving up for something else!) and for college students who are starting out with a single portable induction burner and want a full set of cookware. You’ll get good induction cookware for a reasonable price with this set. ⇒ To see the latest price on this T-fal Nonstick set, click here. This is one of the high-quality induction cookware sets available for a reasonable price. But first, the most important thing to note is that the smallest pan (the One Egg Wonder) is NOT induction compatible. Taking this into account, you will see why this is still a great induction set when you look at the details on what’s included for the price. The Prometal nonstick interior surface is so durable you can use metal utensils with it and it’s scratch resistant. Also all the handles are riveted for strength and they have a silicone outer for comfort. 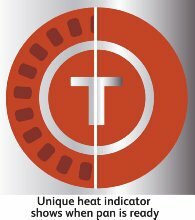 The upgraded T-fal Thermo-Spot is a heat indicator to show you when the pan is preheated and ready for use to seal in the flavor of your food. This set is dishwasher safe and can be used at temperatures up to 400 degrees Fahrenheit. This means you can use it in your oven safely. You’ll also get vented glass lids in this set. As already mentioned, I love using glass lids because I can check on my cooking without always lifting the lid and reducing the heat. Another important piece of information…if you want your pans to be induction compatible you must buy the “professional” T-fal set. T-fal also have an “ultimate” set but it’s NOT induction compatible. It’s the “professional” set that has the stainless steel base which lets you use it on induction cooktops. Best Induction Cookware Set in Non-stick – what do you get in this 12-piece T-fal set? As mentioned, the tiny fry pan is not induction compatible so please don’t rely on using it. Personally, I’d give it to a family member or friend who doesn’t use an induction cooktop. Like any nonstick cookware, you shouldn’t use these pots and pans on high heat. Low to medium heat is best for longevity of the set. You’ll find the stainless steel base is good quality and provides good heat distribution to the food so you shouldn’t need to use high heat anyway. As mentioned, you’ll find this is a common limitation on almost all nonstick cookware so it’s not really a disadvantage on this set, it’s just something to be mindful of when purchasing cookware. This T-fal C515SC Professional 12-Piece Set is the best induction cookware set for anyone looking for high quality nonstick pots and pans. T-fal produces high-quality products and if you love the T-fal Thermo Spot then you’ll be really happy with this cookware set. This is not a cheap cookware set, but it’s not at the top end of price either. Being high-quality hard anodized, the pots and pans perform amazingly well. This is one of those induction cookware sets you’ll be proud of for a long time. A lot of induction cookware reviews seem to forget about hard anodized pots and pans but they are very popular with consumers. The food slides off the surface without sticking, the set is dishwasher safe and the pots and pans can be place in the oven up to 500 degrees Fahrenheit. This set is made of hard anodized aluminum with stainless steel bases with an encapsulated aluminum core. This provides for good heat distribution. The pots and pans are nonstick inside and out making for easy clean up. Also, the surface is durable enough to use metal utensils when cooking. Another feature you’ll see on this induction cookware set is the handles are riveted for strength. And they’re stay cool handles for comfort. Also this set includes heavy gauge stainless steel lids. These pots and pans are suitable for all heat sources. So if you’re using both induction and another burner like gas, electric or ceramic then you’ll enjoy being able to use these on every cooktop. This Circulon Infinite 10-Piece Set is the best induction cookware set for anyone who is looking for a superior nonstick surface. A lot of people choose hard anodized because they want a high-quality nonstick pan to avoid using too much oil in their cooking. This is a popular cookware set with an average of 4.6 stars out of 5.0 for almost 300 reviews on Amazon at the time of writing. So, if you’re wanting high quality hard anodized cookware for induction, you’ll be pleased with this 10-piece Circulon set. ⇒ For an excellent price on this nesting cookware, Click Here. For the price, click this link. If you’re looking for a cookware set for your RV or an apartment with a smaller kitchen then you’ll love this nesting induction cookware set. Also, you don’t even need a small kitchen to take advantage of a nesting set. When I went through a phase of owning many large ceramic bowls, platters and cake stands, I gave priority to these items and I used a nesting cookware set to save on space in my kitchen cabinets. Nesting cookware definitely serves a purpose. Since a lot of people use single portable induction cooktops in their RV you’ll appreciate one of these induction cookware sets to use on the induction cooker. If this is you, you’ll want one of the best induction cookware sets that is also suitable for a RV. And nesting is perfect for smaller storage spaces. 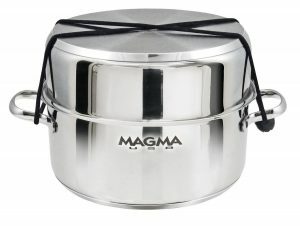 This Magma Products set is 18/10 stainless steel with removable handles for storage. Each pot and pan includes a triple clad base for even heat distribution. Furthermore, the best thing about this induction cookware set is how little space it takes when everything is collapsed together. The set even includes a bungee cord to hold the set together. It fits in less than half a cubic foot of space for storage. ⇒ At the time of writing, it was hard to find this set. However, the best price I found was Here, and since you can order it from Amazon this means it’s readily available for most people. ⇒ For an excellent price on this ELO cookware, Click Here. This ELO Black Pearl Stainless Steel induction cookware set is designed in Germany and has won awards. The appearance is stylish but that’s not the best part. The lids stand up on their own. If you’re reading induction cookware reviews to find the most innovative and stylish cookware, then this is a set for you. Yes! Finally you get saucepan lids that don’t drip all over your counter every time you need to stir a pot. Amazingly, the lids stand up vertically on their own resting on the lid handle. It’s a very clever design. Also, the lids don’t drip because there is an edge to catch the condensation when they’re standing vertically. They’ve thought of everything. And there’s more. This cookware is induction compatible with glass lids so you don’t need to lift the lid to see your food. When you want to drain pasta there’s no need to fuss around with dropping the lid or trying to transfer the hot food to a colander because the lid has special draining holes at one point in the edge of it. With the silicone edges to the lid and lid handle, you simple hold the lid securely and drain liquid from the pot directly. The silicone on the lid and the heat isolated handles let you hold the lid in position for easy-pour draining of the liquid. Another advantage is that your fingers are protected from the heat. This is the best induction cookware because it also gives you the option of cooking with or without the steam release on the lid. You can choose. This high quality induction cookware set looks good and is a pleasure to use. Finally, you get cookware with all the practical design built-in. 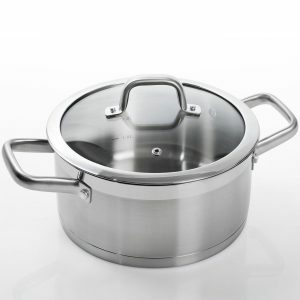 the 9.5-inch Stainless Steel 18/10 Casserole Pot has a liquid capacity of 5.3 Liters or 5.6 quarts. This is one of those cookware sets that you know you want but you’re not sure whether you can justify the cost. Sure, they’re not inexpensive (you can check today’s price here). But you know you’ll be cooking with this enameled induction cast iron cookware set for decades. This is the best induction cookware for longevity. So if you want to mentally amortize the cost over the next couple decades, perhaps that’s a way to look at it and feel comfortable with the cost. Personally I love this blue color shown above. This blue really appeals to me. However, if it’s not your thing then there are 8 more colors to choose from (check the link above to see colors). If you’re looking for the best induction cookware you’ve probably looked at cast iron, here’s the best. You probably already know this because Le Creuset’s reputation tends to precede it but… this is very high quality cookware made in France. You will get impressive cooking results using Le Creuset. Is enameled cast iron safe to use on induction? If you love red cookware take a look at the red version of this Le Creuset set. Just one word of caution, when using enameled cast iron cookware you need to be very careful on induction cooktops. This cookware is very heavy (and this gives you great cooking results) and you need to make sure you don’t drag the pans across the glass cooktop because it can scratch the surface. Another reason not to scrape it across the cooktop is that it may damage the bottom of the pan itself in addition to the cooktop. You also need to make sure you don’t drop one of these beauties on your cooktop. It will end in disaster! The advantage of using enameled cast iron cookware on an induction cooktop is that the weight keeps it in place so it won’t want to slide around like some of the lighter pots and pans. One of the best things you can do to protect your induction cooktop is to place a silicone sheet on top of the cooktop, under the pot so there is no risk of scratching. This is one of the magical advantages of induction. It doesn’t need to be in direct contact with the pot to work. Just make sure your silicone sheet is thin enough to not affect the induction cooking. This set is safe to use on induction cooktops, ceramic, halogen, gas, electric and in the oven. Another advantage is that the phenolic knobs will withstand temperatures up to 500°F so you can use the lids in the oven. With such versatility they make a great gift for a loved one who likes to cook. The skillet’s black enamel interior finish does not require seasoning and is designed for higher temperature cooking. Another advantage is that the Dutch oven and saucepan have a sand-colored enamel interior making it easy to see the food and monitor cooking progress. The enamel surface is made to resist chipping and cracking. You will get longevity from this set. This Le Creuset cookware set is dishwasher safe. If you’re hand washing it you need to avoid harsh scrubbing abrasives. Nylon or soft pads or brushes should be used for hand washing. If you’re looking for the best induction cookware in cast iron, this is the one. If you’re looking for the best induction cookware in ceramic, then take a look at this Vremi 8 piece set. This cookware comes in three colors. You can get yellow, blue or green. It is designed to look great at your table for serving. The ceramic coating ensures even cooking temperatures and ceramic is also nonstick. This is an advantage if you want the convenience of nonstick but you don’t want a Teflon surface. Ceramic heats quickly and evenly. This cookware is made with a durable die cast aluminum body with a ceramic coating. It is scratch free, non toxic and BPA-free. Not only do you get healthy cookware, but you also get good looking cookware. Add some color to your kitchen! The outside of each piece of this cookware is a heat-resistant enamel surface. This Vremi cookware set is induction compatible. It contains a spiral base that works on induction, gas, electric or halogen stovetops. 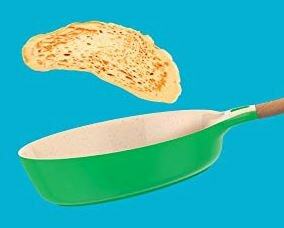 The advantage of the angled frying pans is that you can flip or toss food more easily. Take a look at the picture below and you’ll see the angled side to the pan. Just a word of warning about this set. You can’t put this cookware in the oven. This induction cookware set is dishwasher safe but some buyers have said that the handles don’t look as good if you place them in the dishwasher every night. And they prefer to hand wash them. Since this set really is stunning and can be used at the table you may want to consider keeping it looking perfect by hand washing. Is there a steam vent? Each of the lids is designed with a small gap between the lid and the body so there is a steam release. This ensures your pots don’t boil over. By clever design they’ve included the steam gap without needing to put a hole in the lid. These pot protectors stop scratches on your cookware when storing. These pans are quite heavy but not as heavy as cast iron. So, if you’re looking for a good quality heavy ceramic cookware set with even heat distribution you’ll love these. If you want to keep your ceramic pans looking perfect you’ll want to use bamboo or wooden utensils. This 7 piece bamboo cooking utensil set is great value and high quality. You’ll enjoy using it and get good durability too. Can you store ceramic pots together? To store them together you’ll want to use pot protectors. These are a type of soft cloth or insert that stops one pot from scratching the next one in it. You can take a look at pot protectors here and easily order them online. Many people prefer a ceramic induction cookware set because of the health benefits. But even if that’s not your reason for getting it, these pots and pans will look great in your kitchen and even better at your table when serving. You’ll also love the benefits of the nonstick ceramic surface. It makes clean up so easy. The food just slides right off. This Vremi cookware is very popular and has many happy customers. At the time of writing the reviews on Amazon were an average of 4.3 stars out of 5 for more than 300 reviews. You can take a look yourself! Induction cooktops are a delight to use. If you have the right pots and pans it makes the cooking experience even better. Enjoy your new induction cookware. ✅ Need a portable induction burner? ⇐ See all the details here. This entry was posted in Induction Cooking on September 16, 2017 by Edwina.